"Brazilian Churrascaria" once a novel concept to American diners, has become the familiar in recent years - the words immediately conjur up an image of a traditional dining room, with servers making their rounds at each table offering giant skewers of meat that are carved directly onto your plate on request - as much as you can handle, until you reach the point where you can barely stretch out an arm to turn the red/green indicator over, signalling that you need to stop (at least for a while). (1) You can choose from their ready-made selection of entrees and hot/cold side dishes in a buffet-style line - but pay only for what you take, by weight - or (2) order a la carte items from the menu. The other innovation was to put a chic yet casual space in a shopping center setting, and offer Brazilian entertainment on Sundays with music and dancers. 'Bicycletta' and I had passed by Ummba Grill many times on our way to the AMC Theater at Century City, and was always intrigued by the concept, the chic lounge style space on the terrace, the Brazilian dancers in full feathered garb - as well as the banners advertising Happy Hour specials. Emboldened by my recently scored Restaurant.com certificate (for $25, which I bought for $2 during their promotion for 80% off original price of $10), and its requirement for $50 minimum food purchase - we decided to check it out with 'Lindyhopper' last Sunday evening during the Happy Hour window, to further stack up the savings, and order anything we wanted on the menu. Since we were there during Happy Hour (Mon-Tues all day, Wed-Sun 4pm-7pm) - this meant we could also get specialty drinks for $5 (with a few exceptions, like the Mediterrenean Capirinha) and 1/2 price appetizers (all except sliders), wines and beers. I had the regular Capirinha ($9 regularly), while Lindyhopper and Bicycletta had sodas. It was the start of the cold weather in LA, so we sat inside at the marble tables, though being right next to the fire pit did not help make us any warmer. We couldn't wait to get our hands on food both to warm up and to see how it all tastes - but were having a difficult time narrowing down choices from the appetizer menu as everything looked good. Then we realized since we were within the Happy Hour timeframe, we could actually just go crazy with ordering whatever we wanted! We finally decided on four plates to share, family style, so that we could sample more dishes. The first was the Salmon Croquettes with Garlic Aioli ($8.95 regularly). The croquettes were attractively presented as a set of two sitting on a splash of aioli, flavorful with a crispy outside and a flaky, warm filling of salmon. 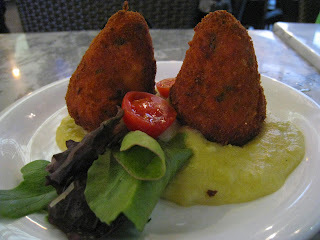 The aioli was balanced and well proportioned to the croquettes, so as not to overpower them. 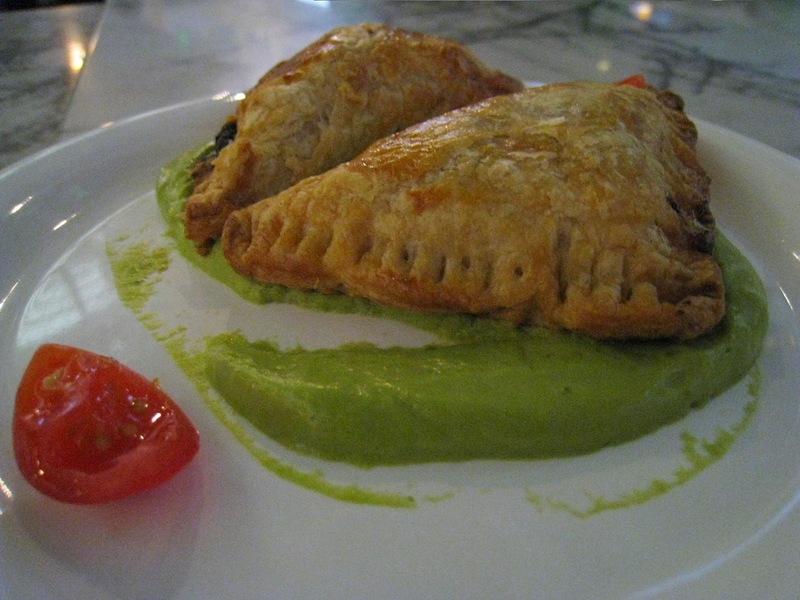 Next were the Shrimp Empanadas with avocado tomatillo salsa ($8.95 regularly) - which came two to a plate, and had fairly large and tender pieces of shrimp inside. The pastry shell was flaky, but could have been served at a slightly hotter temperature (though perhaps we were just affected by the cold weather - and the dining area is sort of an open space leading out to the bar on the terrace). Our third appetizer was the Coxinha - fried balls stuffed with chicken ($8.95 regularly) - served up on bed of mashed potatoes with a few greens and cherry tomatoes. Between the two 'fried balls' appetizers we had in this meal, I preferred the Salmon Croquettes, but may be a bit biased as I am not a fan of chicken, at all, in general. Though, this one tasted more like tuna than chicken. 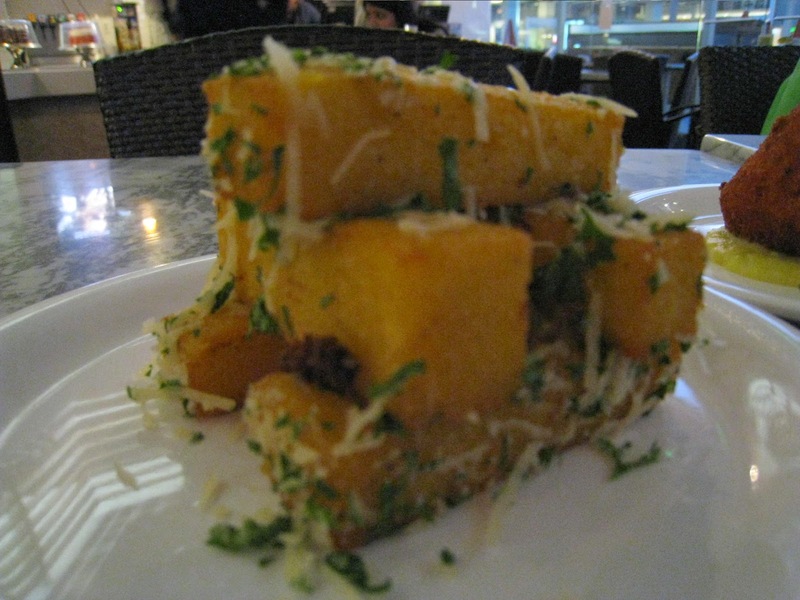 Our last appetizer was the Fried Polenta ($7.95 regularly) - which looked like oversized fries topped with shredded parmesan cheese and herbs (parsley?). Interesting way to serve polenta, and I liked the combination of the crispy outside with the crunchy / mealy inside. 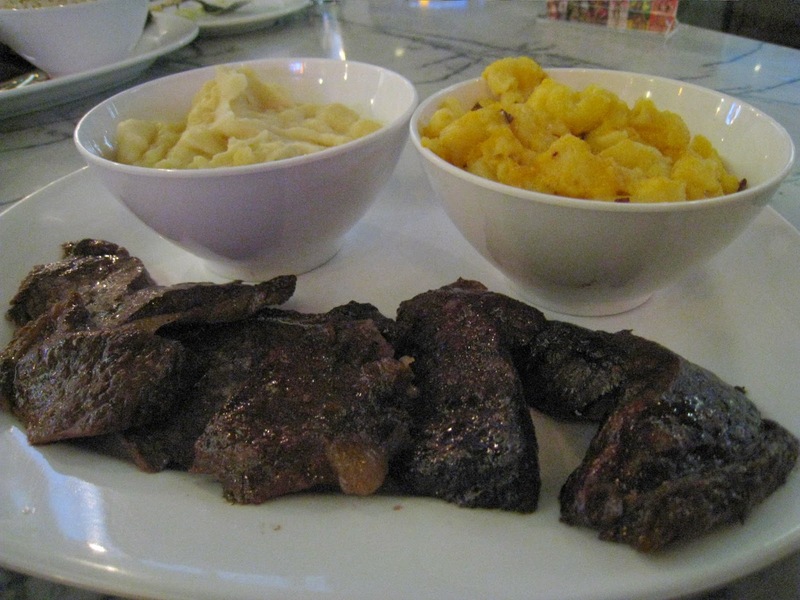 For our entree, all three of us ended up choosing the Picanha ($15.95) - 4-5 slices of top sirloin with Brazilian special seasonings plus two side dishes. Temperature was a big part of experience...and unfortunately on the day of our visit, everything on the plates were just too cold. Our side dishes were also lackluster: Three Cheese Macaroni (fairly bland and not rich and creamy enough in texture) - two orders, Brazilian Garlic Rice (garlic flavor was too muted for our taste), Feijoda (black beans with chunks of beef - single note in flavor), Plaintains (got cold too quickly, wasn't crisp on the outside nor soft on the inside), and Mashed Potatoes with Arugula (could be a little more rich and creamy). That said, this is better than your average mall meal, though I would have been sorely disappointed if I had paid full price (and in my mind of course I am still comparing the quality of the meat to other Brazilian churrascarias I had been to in the past - which were fall-off-the skewer, amazingly tender, juicy and flavorful). One other point of disappointment was in that we missed the "Brazilian Sundays" Entertainment - there are supposed to be dancers every Sunday 4pm-10pm - but from 4pm til 7pm when we left, there was no entertainment to be seen. That would have been a highlight and part of a unique experience that one would not expect at a shopping center - and would have justified the prices and average tasting food. That said, we left satisfied with the value that we got from the meal, only because of all the compounded deals - with the happy hour pricing for all appetizers and my specialty drink, and the application of the $25 Restaurant.com voucher (which I paid $2 for during a promotion) - the total cost came to $66 including a 20% tip ($64 + $2 for the Restaurant.com GC) for three people. On top of all this, I signed up at the mall concierge for Westfield Century City Dining Rewards - each food purchase at the mall, whether it be at the dining terrace, any of the other eateries around the mall, or any of the food stores (e.g. See's Candies) can be recorded by the concierge within 7 days of purchase. Once you accumulate $500 in receipts on the above, you can earn a $25 reward certificate to spend as you like at the mall. So, my meal was not only fairly low cost, I also earned $64 towards the total needed to get a $25 reward certificate! 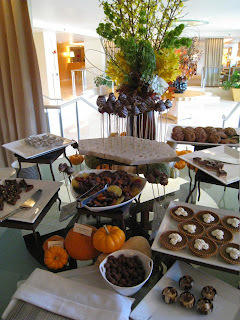 The Restaurant at L'Ermitage Beverly Hills - Best Thanksgiving Brunch Ever! 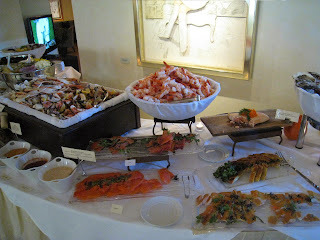 Fifteen years in L.A., and this is the first time I'd been to Thanksgiving Brunch at The Restaurant at L'Ermitage Beverly Hills - a splurge that occurred only because my brother and his wife were visiting from Canada - and now I can't believe I let all this time pass without discovering the amazing seafood extravanganza that is on offer! At first glance, the $80 per head price looked like a lot. However, you will definitely get your money's worth and more in some truly incredible seafood - it's all you can eat, and they really had me at 'Caviar Station'. 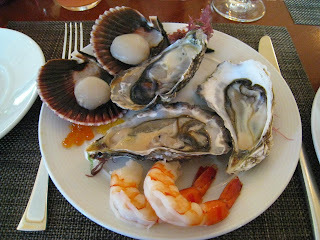 The spread included the freshest west coast oysters I've had in recent years, and some amazing, tender and subtly sweet raw scallops on the half shell (which I haven't even seen served anywhere else) in a beautiful display. ﻿Various sauces were on offer including cocktail, black pepper mignonette, chipotle mayo, and louie - but as a purist, I preferred the taste of deep ocean in the oyster, and to let its natural flavors shine through unobstructed - the oysters at L'Ermitage were simply perfect on their own. There was also a giant bowl piled high with jumbo shrimp, platters of smoked fish including salmon and trout, and shellfish including mussels and crab legs & claws. 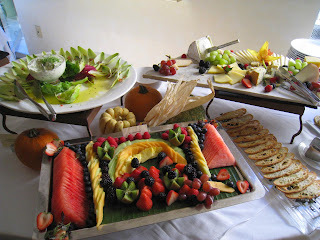 The feast was served in a relaxed, casually chic space off to the side of the lobby of the boutique hotel. Aside from the incredible raw offerings on the seafood table, there were also some cooked items including Poached Salmon and Salmon En Croute with Saffron Sauce. 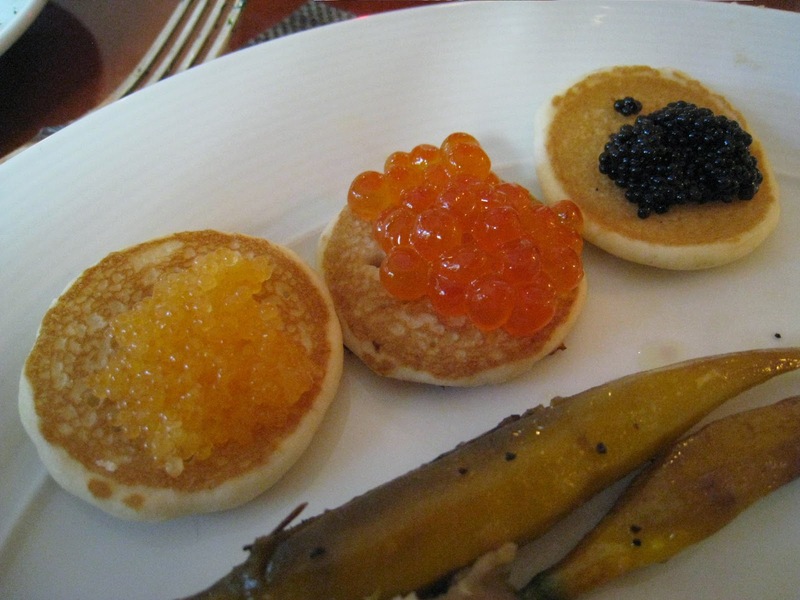 My favorite by far though, and where we truly got our money's worth, was at the Caviar Station - where a trio of caviars were served consisting of Sturgeon, Whitefish and Salmon along with Potato Blinis and traditional garnishes from chopped hard-boiled egg yolk to red onions. As you can get the Salmon Roe easily at any sushi joint ('Ikura'), we focused mainly on the Sturgeon and Whitefish varieties. We were able to maintain some semblance of decorum by scooping just small spoonfuls onto our plates at a time, but shamelessly went back for seconds and thirds...and easily consumed $80 worth, each, in caviar alone. 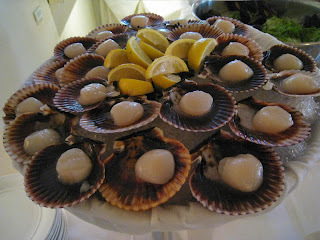 So they were Black Pearl brand, not top of the line, but still great and amazing for AYCE service. I do want to acknowledge the incredibly warm hospitality of the staff at the restaurant - unexpected for any venue in Beverly Hills, at least towards relatively young and obviously not independently wealthy foodies with a propensity to snap hundreds of photos of every dish from every angle. Though initially weary of how we would be treated amongst tables of 'old money' customers in their forties and fifties, we were happy to find that we were made to feel like VIPs throughout the meal, and instead of frowning upon our excitement about the AYCE caviar etc., several of the waiters and even the manager were very freindly and took the time to let us know when the rapidly depleted jars of caviar had been replenished - and helped us pour and carry our drinks over to the table when our hands were full with plates. For that I give the team top ratings for service! Although our focus was clearly on the seafood, there were also highlights on the salad / fruit / cheeses table - my favorite of which was the Artichoke Flower with Goat Cheese & White Truffle Oil, very rich, creamy and infused with the fragrance of white truffle. The hot foods section was overshadowed by the seafood table, but still offered some highlights including the flavorful Chestnut and Sage stuffing. The Roasted Breast and Leg of Tom Turkey was too dry in my opinion, as was the Cherry Glazed Ham. In order to save room for the amazing scallops and oysters, we did not get to the Chef's Station, which offered traditional eggs benedict as well as Roasted Herb Lamb Leg with Au Jus. 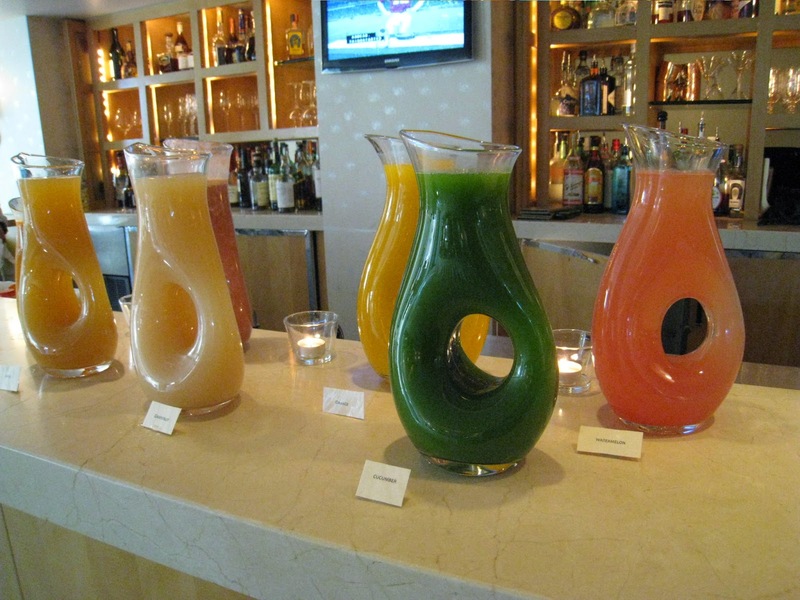 To balance out the heavy gorging, we hit up the beverage station where there was a great variety of healthy, fresh juices on offer from Grapefruit to Strawberry Banana, to Watermelon. Those who have the stomach for alcohol this early in the day can also order Mimosas or wine at the table. As we reluctantly gave in to our limited, and overextended stomach capacities, we were advised that there was a chocolate dessert and coffee / tea buffet to be had - out in the lounge area. This is the Thanksgiving meal that keeps on giving! We sank into the comfortable sofas in the lounge and braced ourselves for one last round. The chocolate dessert display was mouth-watering - with tall sticks of chocolate dipped, perfectly ripe strawberries, individual pumpkin tarts, chocolate and cocoa powder enrobed nuts, hazelnut chocolate confections, triple chocolate mini-layer cakes, and walnut-mousse in scalloped chocolate shell. I loved everything on this table, except the chocolate dipped dried fruits which were a bit too tough - and the chocolate coconut balls (only because I personally do not like coconut flakes). The chocolate dipped strawberries and walnut mousse in chocolate shell were particularly amazing - and the pumpkin tart was quite good as well, light and at the perfect portion size. We were also able to choose from a variety of organic teas like Hibiscus Oolong, to help us digest, as well as imbibe as much as we wanted of Mulled Apple Cider, and Coffee. All-in-all, The Restaurant at L'Ermitage Beverly Hills definitely made this Thanksgiving a very happy one for me and the visiting fam. Would definitely return for Thanksgiving Brunch next year - if just for the seafood and caviar alone (and the lovely space / personable service)! It also doesn't hurt that the restaurant uses OpenTable, so reserving and dining at L'Ermitage counts towards OpenTable reward points redeemable for a gift certificate. Merci beaucoup for an amazing Thanksgiving, L'Ermitage! In times like the past few weeks, where it's been an absolute freight train of frenzied activity, I really appreciate places like Cake House that lend a spot of sweetness and ease to my day. In essence, Cake House is sort of like a grocery store bakery - but attached to a korean supermarket (in Koreatown Galleria), and with much tastier offerings. First off, their cakes are not sugar-bricks like typical supermarket fare - but made with light, whipped cream frosting - and they actually take time and care with the presentation of each piece to ensure it looks perfect. Located in the lower level, just outside the entrance to the supermarket - I like to think of Cake House as a 'drive through' for my shopping cart on the way in to Galleria Market to pick up ingredients for a delicious 'home-made' Korean BBQ dinner (ok, a cheat - the market offers pre-marinated meats of all sorts including galbi and bulgogi, just grill and serve - as well as pre-packaged side dishes from kimchee to seaweed salad - perfect for a no-fuss weeknight meal. I also love the convenience of the bags of frozen mandu - tasty korean dumplings - that services protein, veg and carb intake all in one easy package, and are easy to pan fry at home for a quick bite). If Cake House were a drive-through, I would say it is the In & Out of desserts, where other market bakeries like Ralph's would be Mickey D's (McDonald's). So, what I bought on my latest excursion: Cream Mocha ($3.25) and Chocolate ($2.75). The Cream Mocha was fantastic, with a light whipped frosting layered with sponge cake, both at the perfect level of mocha flavor, and topped with berries, a 'naked' (natural, unsalted) almond and a single coffee bean. The Chocolate cake was a little too dense and bitter for my taste - I like my cakes light in texture and rich in flavor - and this one was overwhelming in both areas, requiring some work to carve out sticky forkfuls. 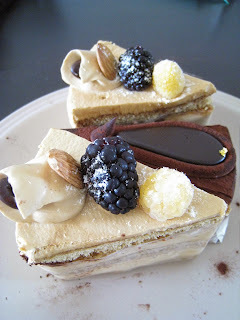 While quality and taste are a bit inconsistent, overall it is still above average for supermarket bakeries - the convenient location is a huge lure (beautiful pieces for your dinner table without any effort - focus your grocery shopping / cooking on your savory courses and let Cake House take care of dessert!). Cake House also offers whole cakes, cake 'rolls' (e.g. cake logs that serve 6-10 people $18-$20), cupcakes, individually wrapped macarons ($1.25), individually packaged buns filled with ingredients like red bean paste, a perfectly portable snack to bring to work (which totally beats popcorn or chips, or - *shudder* - twinkies, and is more filling and fresh) and specialty loaves like Chestnut bread or Mocha bread ($6 each). While Cake House is not a 'destination' dining spot by any means (and there isn't any seating available) - the next time I happen to go to Galleria Market I will most likely pop by the counter again. Sweepstakes alert! Win 14-Course Dinner for Two at Providence!!! Win a dream dinner for two at the two Michelin starred restaurant that has been named by Gourmet magazine's as one of "America's Top 50 Restaurants"! Limit one (1) entry per person. Open to legal residents of California 21 years of age or older. See Official Rules for details. It's been a while since my last post - have been busy moving into a new place, work etc.! Will need to catch up soon, but in the meantime, here's a bit of 'fast food' for you to snack on :) "Allez! Cuisine!" Enter Food Network's The Next Iron Chef Sweepstakes for a chance to win a trip to NYC and get a behind the scenes look at Kitchen Stadium, where the winner of The Next Iron Chef will soon step up for battle! Grand prize: Roundtrip flights to New York City, a three-night stay at the Maritime Hotel (right across the street from Food Network headquarters), a tour of Kitchen Stadium and Food Network Kitchens, VIP seats at a taping of Iron Chef America, plus $500 spending cash for your trip! Limit one (1) online entry per valid email address, per eligible person per day. Open to legal residents of the lower 48 United States and the District of Columbia who are 21 years of age or older as of November 8, 2010. See Official Rules for details. Grand prize: 3 night trip and VIP passes to Food & Wine Aspen Classic event June 17th-19th, 2011 plus 6 month delivery of Robinson's Prime Reserve aged steaks and gourmet meats. The 2010 event included seminars by culinary luminaries including José Andrés, Thomas Keller and Tom Colicchio! Limit one (1) online entry per person per email account per day. Open to all legal U.S. residents who have reached the age of majority in their state of residence at time of entry. See Official Rules for details. Check out the Sweepstakes Page "Win Your Next Bite" - for more foodie promotions! 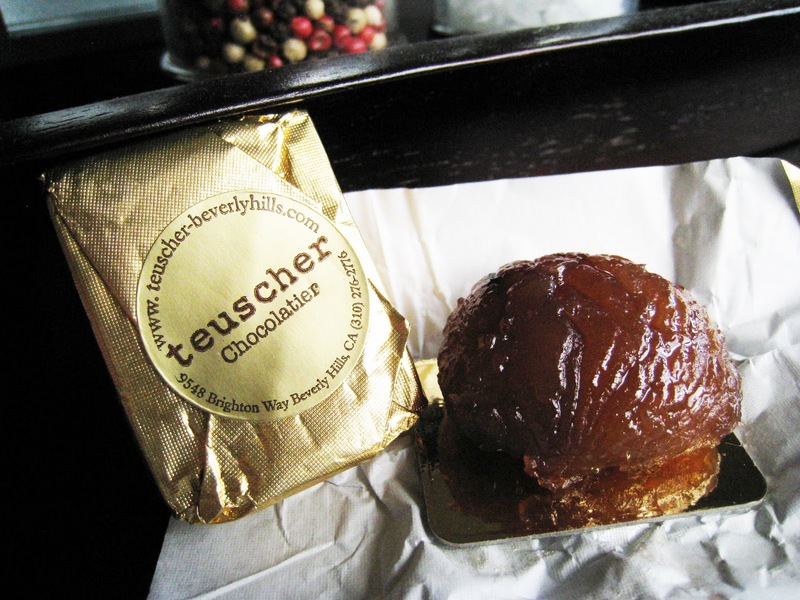 Just before Halloween, Teuscher Beverly Hills announced the arrival of Marrons Glacés in their stores, for a limited run of several weeks. Already a huge fan of Teuscher's amazing, luscious Champagne Truffles (if I had the opportunity to choose my last bite on earth, at this moment it would be a tie between a Laduree macaron and a Teuscher champagne truffle) - I was excited to see if their latest treat would live up to the hype. 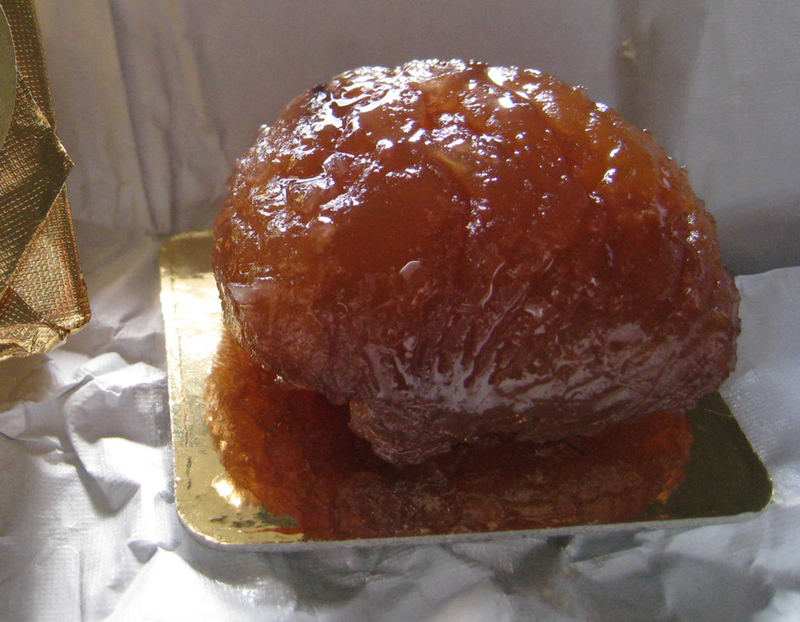 Marrons glacés are candied chestnuts made by immersing and heating peeled and blanched chestnuts in a syrup solution, then drying them. A European delicacy that is particularly popular in France, especially during the holiday season (eaten on its own or as garnishes on desserts) these little bundles of joy originally gained fame in the Palace of Versailles under Louis the XIV. A true marron glacé apparently takes several days to cook from start to finish, making it an expensive delicacy - one of these gold-foil wrapped chestnut treats at Teuscher Beverly Hills costs $5.25! So, two was all I could afford at a time - but they were delicious, with just the right amount of subtle sweetness, and the chestnut was so tender that it falls apart on contact (ok, so you're supposed to eat it in one bite, but I was trying to make it last longer). 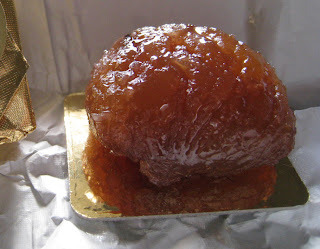 And I leave you with a photo of a sunlit Marron Glace - the light really brings out the gorgeous semi-transparent amber / caramel colors in the treat. This is one I will be looking forward to next year as another new personal holiday tradition! Thanksgiving Dilemma - To Serve or Be Served? As my parents live overseas, in Thanksgivings past I have been graciously hosted by families of some amazing friends, who were kind enough to take in a stray for the day. This year, my brother and his wife will be visiting from Montreal and staying with me for a month (starting mere days after I move!) so I'll be playing hostess for once during a hectic time. And so I have a confession to make: I've never cooked a whole turkey in my life - and have no idea what to do with a bird that size! Though it could be an exciting culinary adventure, and possibly a fun day-long activity for all of us - whipping up all kinds of sides in the kitchen together while the turkey's in the oven - it could also be a DIY disaster. The planner in me went immediately to work looking for backup dine-out options that I suspect will quickly turn into our preferred choice. I was pleasantly surprised by all the restaurants (aka lifesavers / my personal heroes) that will be open Thanksgiving day - and some of the very creative interpretations of the traditional holiday meal, that they will be offering. The Bazaar by José Andrés is offering a five course prix fixe menu for $65 including their take on Turkey, Brussel Sprouts with 'lemon air', Papas Canarias, a spinach dish, and a sweet potato dessert. The SLS Hotel is also offering a prix fixe brunch 11am-3pm for $59, a tasting menu for $65 and carving station with traditional turkey and trimmings for $49 November 25-28 starting at 5pm. The Stinking Rose's $29.95 prix fixe dinner is not for the faint of heart! The three-course meal starts with a House Salad, then moves onto a 400 Clove Garlic Roasted Turkey With All The Trimmings, and finishes with Pumpkin Pie Ala Mode. You can get a child's portion of the same menu at $19.95. 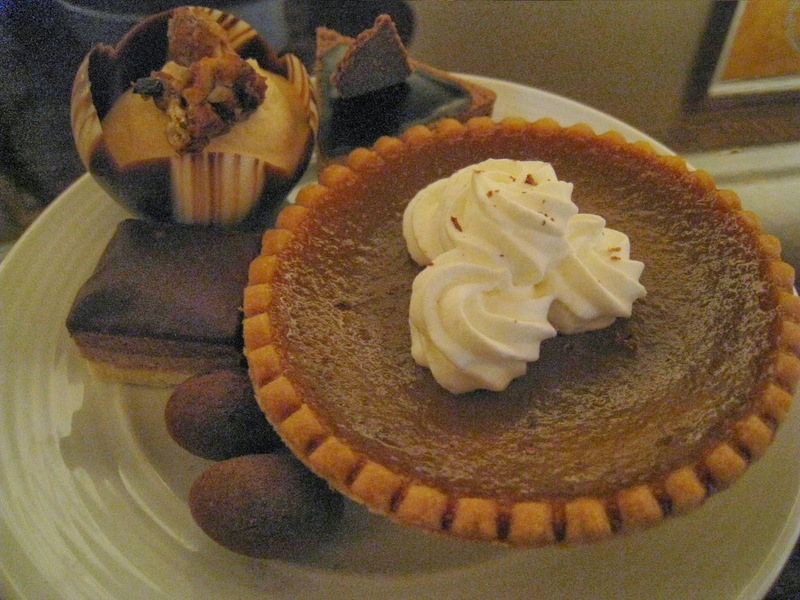 Trader Vic's Polynesian four-course dinner for $45 - Lobster Stuffed & Shrimp with kaffir lime bearnaise Asian pesto, Mixed Green Salad, Choice Of Stuffed Drunken Turkey Or Trio Of Squash, and choice of Pumpkin Tart or Apple Pecan Bread Pudding. Patina Chef Tony Esnault's $70 prix fixe four-course Thanksgiving menu features two choices within each course - including Maine Lobster & Chestnut Velouté, Butternut Squash Risotto, Roasted Organic Turkey or Seared Day Boat Scallops, and Piedmont Hazelnut Sponge, Whole Wheat Tuile with Ovaltine Rum Ice Cream! 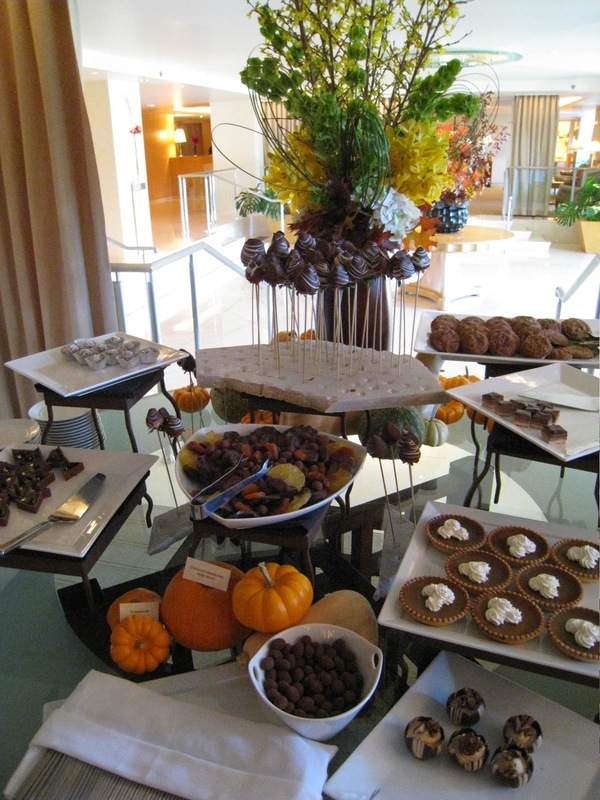 By the Beach: Whist at the Viceroy in Santa Monica is offering a gourmet Thanksgiving Buffet From 1pm-7pm. Chef Tony Disalvo Is Preparing A Special Feast! Pinot Bistro's $45 three course Thanksgiving menu offers choices of first, main and dessert including Roasted Pumpkin Soup with spiced creme fraiche, or Smoked Salmon with buckwheat blini, egg mimosa, chives, and citrus; Roasted Turkey With Sweet Potato Gratin; and the dessert with the most awesome name so far - "Pumpkin and Hazelnut Religieuse". So after perusing all the incredible menus, I think I've pretty much decided we're eating out. Especially since my brother and his wife are considering moving to much sunnier SoCal, this might be a great time to add 'good eats' as another 'plus' to their list of reasons why they should. *For those who feel like having restaurant fare at home - Susan Feniger's STREET is offering Tandoori turkey breast, lobster, lamb roast or jackfruit with an eclectic list of mouth-watering sides like Pandan and Coconut Creamed Corn and Spaghetti Squash with Chipotle Honey Butter. Tandoori dishes run $15-$25 per person, and side dishes are 3 for $40, 5 for $55, and 7 for $65 (most sides serve up to four people). Order at least 3 days in advance - last day for pickup is Wednesday, November 24th. See menu via link above for details. A great take home dessert option is of course Tartist, whose apple tart was so amazing that I still remember the taste from Artisanal LA a couple weeks back. They have a 'Special Pumpkin' pie on ginger crust that I can't wait to try, and of course, I have already ordered an Apple tart with apple slices, rosewater, persian-honey-vinegar glaze, and crushed pistachios on mascarpone and a french crust! Even if I'm eating out, I just want to have these tarts around over the holidays for the fam to discover and enjoy :) Bringing a Tartist creation to Thanksgiving (if you have any foodies in your midst) *will* make you a rock star at dinner. Orders close November 14th for pick up Wednesday or Thursday 11/24 or 11/25. On a day when voters turn out in droves to decide the fate of California (slight dramatization #1), my coworker "Artist Cyclist" and I made an equally fateful decision (slight dramatization #2) to pay a visit to the much buzzed about 8 1/2 Taverna in Studio City for lunch. Perched auspiciously near Moorpark and Tujunga, just around the corner from my favorite stretch of shops and restaurants in the Valley, the recently opened gastropub seemed to promise great things, with its relaxed and casual yet charming decor including an inviting, open bar area, communal tables and flat screen TVs in front, and cozy, sunlit dining area with its jewel colored cushions and dark woods in the back. 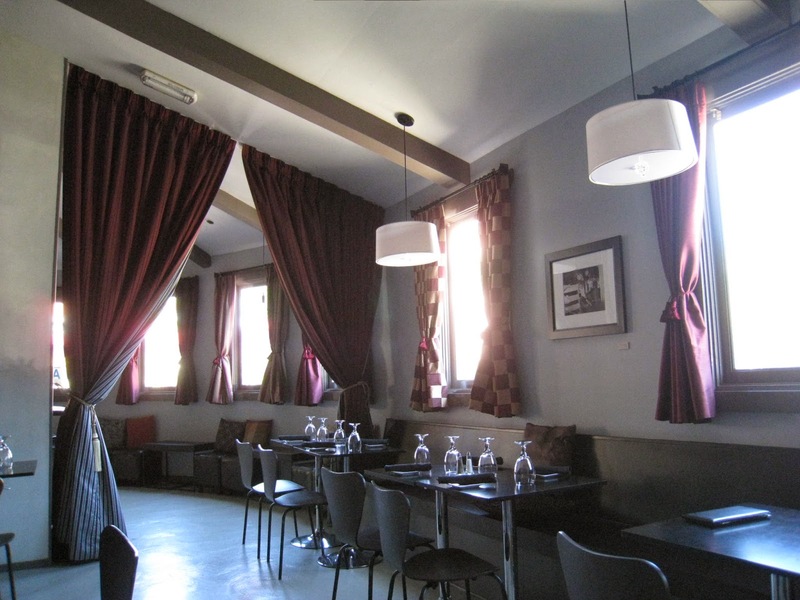 We had been drooling over the menu on the restaurant's site ever since we had considered this place for lunch - and "Artist Cyclist" immediately nominated the Tartufona truffle pizza as our main, which I instantly seconded. But first, we wanted to whet our appetites with a small plate of Steamed Mussels in saffron and Fennel Sauce ($10). Unfortunately, this dish was not meant to be - our server informed us that they were out, and asked if we wanted to choose another small plate instead. ﻿We quickly landed on Langostino Tacos ($9) with avocado, Baby Greens, Shredded Cabbage - and this proved to be a great choice. The perfectly sized morsels of meat were juicy, tender and subtly sweet, offset by the crunch and slight bitterness of the red cabbage, and melding with the perfectly balanced tomato based sauce. 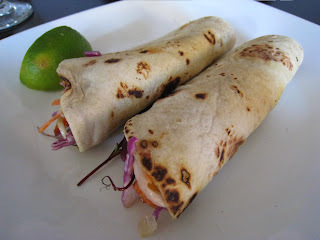 If I had to make a very minor note, it would be that if the tortilla could be made fresh and served just at a slightly hotter temperature - that would have improved the dish. 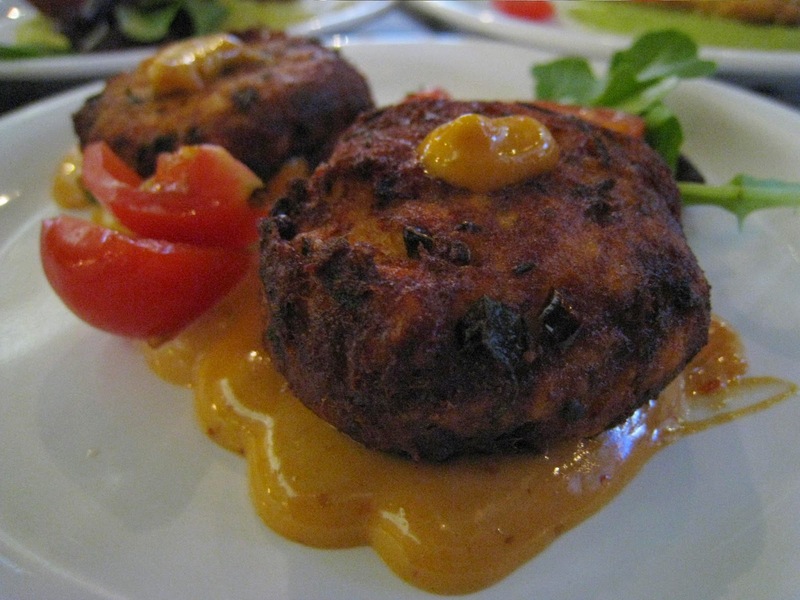 As it is, the tortilla tasted slightly like it was store bought - but overall, still a great starter. While waiting for our main, we were simultaneously driven to complete and utter distraction from our conversation by the pervasive fragrance of truffle - which wafted over from the next table - apparently one of the diners had opted for the Tartufona pizza as well. The aroma infused every sense and I literally could not think straight enough to continue holding conversation - we both stared at the pizza next table over and driveled incoherently until our own pizza arrived. ﻿ Alas, the masterpiece -Tartufona pizza ($25) - was topped with Mozzarella, Mascarpone fondue, shitake mushrooms, and shaved truffle. The truffle was of the summer variety, with gorgeous flecks of white - it was so thinly shaved that I imagined if not for the cheese holding it down, it would float away with the slightest breeze. This balanced amazingly well with the earthy, substantial pieces of shitake. The base of mascarpone fondue added just the right amount of sweetness, and in combination with the mozzarella, held all the elements of the pizza together in a cohesive whole. The crust was also amazing - fluffy and and served piping hot, the better to help release the intoxicating fragrances of the truffle and mushrooms. If not for social convention and need for some semblance of decorum, I would have picked the plate up and licked it clean. As it was, we ate every single crumb off this plate. Definitely the best truffle pizza north of Sunset Blvd. 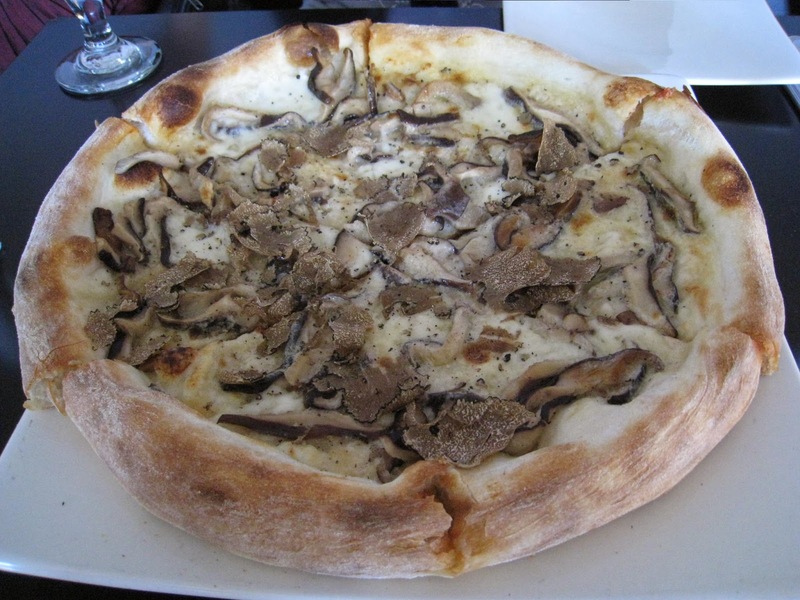 Actually, just to have truffle pizza period, in the effing Valley, makes me an instant fan of 8 1/2 Taverna. But to offer amazing truffle pizza - and the ability to have a fine dining experience in this virtually barren culinary landscape around our office - makes me a fan for life. Will definitely be escaping...I mean, returning, to this place on many more occasions. 8 1/2 Taverna also offers Happy Hour Daily 4pm-7pm - tap into dishes from sliders to shrimp cocktails $5-$8 and drink specials. And, this place is listed on OpenTable, so eligible for reservation points. Thanks "Artist Cyclist" for recommending the place. 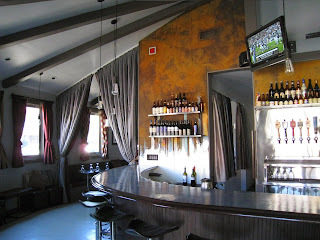 I will be dreaming of the Tartufona tonight and can't wait to go back! Whenever I have time to take a little longer lunch, I grab a coworker and head to 8 1/2 Taverna. Here are two more highlights of awesome bites from one of my favorite spots in the SFV! ﻿ Ahi Tuna Bites ($9) - Smoked paprika cherry Tomatoes, lime fresco salt, sesame oil. Love this - the tuna is cool, velvety, with light crust from careful searing. Perfect starter! ﻿ As a 'glass half full' person, every time I've been to 8 1/2 Taverna I've asked with hopeful, ready-to-plead eyes if they have the Tartufona pizza. On the last few occasions, they had not served this as they did not have truffle in stock. But, they always have daily specials which include amazing gourmet, fresh-baked pizzas. Yesterday I got the Porketta Pizza ($16) with spinach, mushrooms and braised pork belly - an incredibly juicy and flavorful pie. I had enough leftovers to reheat for dinner tonight and it still held up. Can't wait to go back and see what they serve up next!